Agility = moving quickly and easily. We know when we are gliding, we know when we are moving heavily. Equally, when can see on the adjacent court who moves well and who does not. But often more than strength training or explosive movement, the secret can be in a subtle unweighting where the body leads and the feet follow. Sometimes called a drop step, a floating pivot, or a gravity turn – join me for a look into a different world. Jim – I always enjoy your insightful thoughtful videos. I have to say that I’m one who tries not to get too bogged down in the technical aspects of movement and stroke production. I tend to think the best results mostly ‘happen’ when you are: on your toes, on balance, and loose and relaxed – in your movement and your strokes. When in doubt I find the best fix is almost always to RELAX and SIMPLIFY everything. Still – when I view your videos they almost always make me revisit my own strokes and/or movement and ask myself – “is that what I’m doing” … and if not why not etc. I tend to think of myself as a pretty good mover (for my age anyways) so after doing some shadow stroking and movement experiments – I found that – heck yes – that’s exactly what I’m doing when I really need to move quickly out wide or forward – i.e. – get my feet under me or slightly behind my center of gravity and lean forward so that I push off quickly and (never thought about it before, but yes) let gravity propel me forward. Andy Murray is the guy that I think best exemplifies the concept of ‘sprinting’ to wide and short balls – with Borg being an ‘older school’ example – though Borg falls perhaps more into the camp of guys like Fed, Djoker and Edberg that seem to move so effortlessly – almost ‘gliding’ – such that you don’t even notice the ‘dynamic aspect of their movement. The ‘Big Cat’ Miroslav Mecir’ being another great example from the late Lendl era. McEnroe and Sampras are 2 other guys that moved very ‘effortlessly’ – but sometimes only when they felt compelled to do so – usually on approaches to net. BTW – an area that I often have more trouble with than wide or short balls relates to balls that are coming right at me – especially to the FH side. I tend to get a bit lazy and think I can ‘lean back’ a bit and get a clean hit, but the ball is usually still coming towards me so I’m a bit crowded and off-balance – and maybe leaning backwards a bit. So many guys run around their FHs now that they are used to being dynamic in their movement to their BH side to get in position to hit an ‘off FH’ – but my FH is just as good if not better than my BH so my natural instint isn’t always to ‘run around’ it to try to hit a FH and my natural one-handed BH stroke (where the natural contact point and arm are in front of the body rather than to the side like with the FH stroke) makes it much more natural to hit BH ground strokes and volleys that are close to my body or even ones that are right at me. Anyway – I only bring this last point up, because your video made me think that what I need to do to be more DYNAMIC in moving away from balls coming into my body (or when moving to get in position to hit an ‘off FH’) is to do the reverse of what you suggest is optimal for sprinting forward or to the side. I.E. – to ‘backpedal’ most efficiently and quickly – it’s actually best to step forward and push off backwards while leaning back slightly so that GRAVITY’ helps propel you into your backpedal. Again – I did some shadow strokes/ movement to practice this scenario and noticed the difference between backpedaling dynamically (even if just one or 2 steps) as opposed to just ‘shuffling’ my feet to make the same movement. Certainly for me – and I think a lot of players – an underappreciated aspect of movement on the court relates to moving away from an incoming ball and re-establishing balance and space to be able to hit effective ground strokes and volleys. Would enjoy getting your thoughts (and perhaps a future video) on this topic. BTW – an area that I often have more trouble with than wide or short balls relates to balls that are coming right at me – especially to the FH side. I tend to get a bit lazy and think I can ‘lean back’ a bit and get a clean hit, but the ball is usually still coming towards me so I’m a bit crowded and off-balance – and maybe leaning backwards a bit. So many guys run around their FHs now that they are used to being dynamic in their movement to their BH side to get in position to hit an ‘off FH’ – but my BH is just as good if not better than my FH so my natural instinct isn’t always to ‘run around’ it to try to hit a FH and my natural one-handed BH stroke (where the natural contact point and arm are in front of the body rather than to the side like with the FH stroke) makes it much more natural to hit BH ground strokes and volleys that are close to my body or even ones that are right at me. As Oscar Wegner says “the feet come last” = just do the natural automatic way of moving (not special steps just because we are playing tennis). 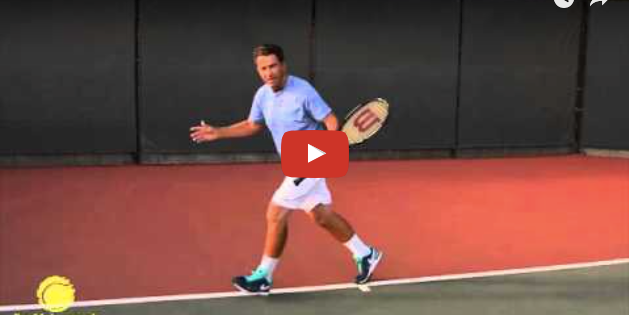 As Jack Broudy and the Bryan brothers say, the next trick is to “move diagonally” – Notice how much more difficult it can be to move directly forwards or sideways to approach a ball. This technique is similar to my preferred split step. Instead of coming down squarely with feet spread, I usually thrust the foot opposite the side I want to turn outward slightly and leave the other foot suspended with no weight on it so it makes me start to lean in the direction I want to turn or travel. As I lean I slide the unweighted foot under me so as I push off with it, it turns my falling motion into a running motion. I think telling a student to land after a split step with feet square is one of the biggest problems with truly understanding what a split step is for. Works for me on the overhead too. Well done Jim, The “start” step is “essential”as you like to say. The polymetric move of bringing the quick little step inward from a wide base enhance the rhythem of arrival moving east or west . North and south directions are not really disimular . We learn this move from the shortstop in baseball . And as you know , Baseball knowledge is eons ahead of tennis . I will have to say though Jim , Thanks to you the gap is getting closer . I am not sure these two movements are mutually exclusive. If we get the timing of the split step close to right, our weight is still off the ground as we read direction, giving us the opportunity to push off the inside foot in the direction of the ball. If the angle of extension of the knee of the outside leg does not exceed 90 degrees, we are still getting a gravity movement to propel us in that direction. This was shown pretty clearly in the clip of Kei Nishikori stepping toward his backhand which was displayed here a month or so back. Great lesson again Jim. How big or small of the first step after the gravitational fall? Thanks for resurrecting an old concept. When I move well it is because I am moving as you suggest and I always get to the ball with my body in balance. When I do not, especially on my backhand, I am unbalanced and leaning and have little power. Sikh martial arts master on the same subject .